The part is marketed by Unipart and their reference number is GSJ6287. A new rear stabiliser bar for the Audi A3, VW Touran and Golf. This type has two ball joints. There is another type which bolts solid to the body rather than a ball joint. 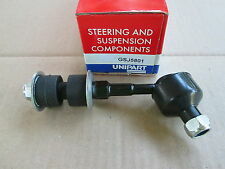 PART NUMBER UNIPART GSJ 5801. Rear - Left and Righ. Toyota RAV 4 2007 MK III [2005-2016] SUV SUV 2.2 D-CAT 4WD 2231ccm 177HP 130KW (Diesel). Rear - Left and Righ. Toyota RAV 4 2008 MK III [2005-2016] SUV SUV 2.0 1987ccm 158HP 116KW (Petrol). Range Rover Mk3 2002 To 2012. Range Rover Sport LS 2009 To 2013. Sport LS 2009 To 2013. Land Rover UK Part Numbers LAND ROVER: RBM000010. LAND ROVER: LR030047. Range Rover. LAND ROVER: RBM000011. Fitting Position: Front Axle; Specification: Axle set Ford Fiesta V 2001 MK V [2001-2010] Hatchback Hatchback 1.4 16V 1388ccm 80HP 59KW (Petrol). Fitting Position: Front Axle; Specification: Axle set Ford Fiesta V 2001 MK V [2001-2010] Hatchback Hatchback 1.4 TDCi 1399ccm 68HP 50KW (Diesel). Unipart Steering & Suspension Components. Boxed Unipart GSV2156. Boxed Unipart GSJ5598. Unipart Steering & Suspension Components. Boxed Unipart GSV2340K. Unipart Steering & Suspension Components. Boxed Unipart GSV2151K. Unipart Steering & Suspension Components. Unipart Steering & Suspension Components. Boxed Unipart GSV2156K. Construction year to: 04/2001, Fitting Position: Rear Axle, Fitting Position: Left, Fitting Position: Right, Tyres: for dual tyres. Boxed Unipart GSV2151. Unipart Steering & Suspension Components. PART NUMBER UNIPART GSJ 5740. MITSUBISHI CHALLENGER I (K90) 2.8 TDi. Fitting Position: Rear Axle, Fitting Position: Left, Fitting Position: Right. LOCATION STEERING 2. A new pair of anti roll bar bushes for a Vauxhall Corsa C from 2000 to 2006. The part is marketed by Unipart and their reference number is GSV2508. Have a good look at the photo because it is exactly what you will receive. If you are unsure if it fits your car please send your make models and registration number and we will check it for you. The package will be dispatched by 2nd class mail or by 1st class if you require a faster service. Boxed Unipart GSV2155. Unipart Steering & Suspension Components. PEUGEOT 206 1.6i 1.9 2.0 HDi ANTI ROLL BAR BUSH UNI PART GSV 2416 FREE P&P! 2.0 HDI 90 Diesel 1997 66 90 4 Hatchback 199912 - /. 1.6 HDi 110 Diesel 1560 80 109 4 Hatchback 200405 - /. SWAG 62 92 1816. PEUGEOT 5094,80. By pressing (. Cross Interchange Parts. FIRST LINE FSK 6251. ). Rear RH and LH Stabiliser Link - GSJ3888. Toyota Avensis 1.6, 1.8, 2.0 1997-2003. We're sorry about that. We will need a full report detailing how the part has been diagnosed as faulty and without this letter we are unable to make any warranty claims. VOLVO S90 2.9 Saloon Petrol 01/1997 05/1998 RWD 24 180 132. VOLVO S90 2.9 Saloon Petrol 01/1997 05/1998 RWD 24 204 150. Construction year from: 11/1995, Fitting Position: Front Axle, Fitting Position: Left, Fitting Position: Right. GSJ5655 x 2. Stabiliser Link. Rear Stabiliser Link - Pair. Ford Mondeo. Boxed Unipart GSV4812. Unipart Steering & Suspension Components. MAZDA 6 (GG) 1.8 Saloon Petrol 08/2002 08/2007 FWD 16 120 88. MAZDA 6 (GG) 2.0 Saloon Petrol 06/2002 08/2007 FWD 16 141 104. MAZDA 6 (GG) 2.0 Saloon Petrol 03/2005 08/2007 FWD 16 147 108. MAZDA 6 (GG) 2.0 DI Saloon Diesel 06/2005 08/2007 FWD 16 143 105. (NEW ,new,great price! PART 159 for my reference. we hope our parts are the cheapest and our service the best :), we are not experts,but our service is great! see label on my picture for info! TOYOTA COROLLA (_E11_) 1.3 Saloon Petrol 05/1997 10/2001 FWD 12 75 55. TOYOTA COROLLA (_E11_) 1.3 (EE111_) Saloon Petrol 04/1997 02/2000 FWD 16 86 63. TOYOTA COROLLA (_E11_) 1.4 16V (ZZE111_) Saloon Petrol 02/2000 11/2001 FWD 16 97 71. MAZDA 626 IV (GE) 1.8 i Saloon Petrol 05/1994 06/1997 FWD 16 106 78. MAZDA 626 IV (GE) 1.8 i Saloon Petrol 01/1992 04/1997 FWD 16 105 77. MAZDA 626 IV (GE) 2.0 i Saloon Petrol 01/1992 04/1997 FWD 16 115 85. A new rear stabiliser mount for the Ford Cougar from 1998 to 2001 and Ford Mondeo from 1994 to 2000. Stabiliser Link. Front Stabiliser Link - Right Hand Side. Toyota Hi Ace. Two new anti roll bar bushes for a Toyota Preview 2.4 from 1990 to 2000. The part is marketed by Unipart and their reference number is GSV2698K. Have a good look at the photo because it is exactly what you will receive. If you are unsure if it fits your car please send your make models and registration number and we will check it for you. The package will be dispatched by 2nd class mail or by 1st class if you require a faster service. Fitting Position: Front Axle left and right; Fitting Posit. more Vauxhall Vectra 2004 MK II [2000-2009] Estate Estate 1.9 CDTI 16V 1910ccm 150HP 110KW (Diesel). Fitting Position: Front Axle left and right; Fitting Posit. more Vauxhall Vectra 2005 MK II [2000-2009] Estate Estate 1.9 CDTI 16V 1910ccm 150HP 110KW (Diesel). Peugeot 406 10/95 - 10/04. Outer Swivel Pin Bush. Front Stabiliser Link. Mitsubishi Shogun. Ball Joint. KIA SHUMA Saloon (FB) 1.5 Saloon Petrol 03/1996 12/1998 FWD 8 80 59. KIA SHUMA Saloon (FB) 1.5 i 16V Saloon Petrol 10/1997 10/2001 FWD 16 88 65. Fitting Position: Front Axle, Fitting Position: Left, Transmission Type: Manual Transmission. A new drop link for the following models. Skoda Fabia 2005 to 2014. Skoda Roomster 2010 to 2015 Daewoo Nubira 1997 onwards. The part is marketed by Unipart and their reference number is GSJ3350. Have a good look at the photo because it is exactly what you will receive. If you are unsure if it fits your car please send your make models and registration number and we will check it for you. The package will be dispatched by 2nd class mail or by 1st class if you require a faster service. A new pair of anti roll bar bushes to fit a Vauxhall Corsa C from 2000 to 2006. The part is marketed by Unipart and their reference number is GSV2508K. Have a good look at the photo because it is exactly what you will receive. If you are unsure if it fits your car please send your make models and registration number and we will check it for you. The package will be dispatched by 2nd class mail or by 1st class if you require a faster service. Hyundai Trajet. Stabiliser Link. Front Stabiliser Link - Left Hand Side. Fitting Position: Front Axle; Specification: Axle set. Fitting Position: Front Axle. Fitting Position: Front Axle; Stabiliser Ø: 17,5 mm. Fitting Position: Front Axle; Engine Code: 17 DR. Fitting Position: Front Axle; Engine Code: 15TD; Stabiliser Ø: 17,5 mm. A new right anti roll bar link for the Kia Carens 1.8 from 2000 to 2002 and Shuma 1.6 and 1.8 from 1997 to 2004. The part is marketed by Unipart and their reference number is GSJ3362. Have a good look at the photo because it is exactly what you will receive. If you are unsure if it fits your car please send your make models and registration number and we will check it for you. The package will be dispatched by 2nd class mail or by 1st class if you require a faster service. Ford B Max 2012 - 2018. A new drop link for Mercedes S class W140 C140 saloon and coupe models from 1991 to 1999. The part is marketed by Unipart and their reference number is GSJ3765. Have a good look at the photo because it is exactly what you will receive. If you are unsure if it fits your car please send your make models and registration number and we will check it for you. The package will be dispatched by 2nd class mail or by 1st class if you require a faster service. Stabiliser Link. Rear Stabiliser Link. Subaru Legacy. Stabiliser Link. Front Stabiliser Link. Toyota Yaris. The part is marketed by Unipart and their reference number is GSJ5757. 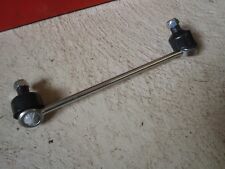 A new anti roll bar link for a Hyundai Accent from 1994 to 2000.